Today I’d like to give you a sneak peak into something we’ve been working on over the last year or so. TL;DR: See the video below. It all started with the realization that it’s so much easier to not consume calories than to burn them by exercising — if you are trying to loose or maintain weight. So many things you don’t have to do just by not consuming extra calories. I’m not saying we should not exercise. Not at all. Exercise is absolutely needed. It’s good for your heart, your mind, your overall health and you should do it regularly. We make a number of fitness apps that help you exercise. But as a means of loosing or maintaining weight, exercising by itself is not very efficient. How long does it take me to not eat that 500 calorie bagel and cream cheese ? Zero minutes. How long does it take me to burn the 500 calorie bagel I ate? 40 minutes at a 10 min / mile pace, plus prep and clean up time, that’s at least an hour. Not very efficient for loosing weight. Why am I telling you all this? Because it led me to believe that knowing how many calories I consume helps me keep a check on how much food I’m consuming. This ensures I don’t consume too much on a consistent basis. “But calorie tracking is too time consuming,” you may say. “I tried it and gave up after a few days.” Remember this thing I said we’ve been working on? We are making calorie tracking a breeze with Cal & Lorie, your personal calorie tracking assistants. You text Cal & Lorie what you eat, you can write it out, tell it to Siri, or send a picture. Cal & Lorie will look it up and log the calories for you. It’s as simple as that. Best of all, it integrates with Fitbit, so you can keep track of your calories burned and consumed all in one place without doing any extra work. Don’t have Fitbit? No worries, we’ve got you covered. Open the Cal & Lorie app for a detailed view of your meal entries to see if you are staying within your goal. Like what you’ve see? Sign up below so we can grant you early access to Cal & Lorie. *If you take that to the extreme you’d think starving is the easiest way to loose weight. But hold on, there’s this thing called metabolism that will rebel if you starve and actually cause you to gain all that weight back. So no starving please. We are just talking about extra calories here. One for you and your two friends. This bundle contains the best training plan progression that will make you and your friends Marathon ready. The bundle includes the following apps: Ease into 5K, Bridge to 10K, Half Marathon Novice 1 and Marathon Novice 1. Competition ends on the 17th of August 2016. The winners will be chosen on the 19th of August 2016. Sport is not just about physical challenge but also a psychological battle. Anxiety and stress are factors that cause muscle tension and therefore have negative effects on performance. There are various ways you can improve your sports performance. One of the secrets is boosting your mental strength. Focus on positivity because negative thoughts will only make you think that you are not good enough and will distract you in achieving your goals. Therefore put your energy on good thoughts. Remember, if you use running mantras – be sure that all the words in your mantra are positive. Be aware of what is outside your comfort zone. Be specific and identify how stepping out will benefit you. Getting out of your comfort zone can be challenging sometimes but keep in mind that once you successfully step out of the comfort zone, it gets easier over time. Take this as a challenge that can help you perform at your peak. Visualization is also known as mental imagery. Did you know that 99% of Olympic athletes practice visualization? Athletes have been using this technique since 1960. When visualizing, be very clear and as detailed as possible. Imagine yourself participating marathon races, surrounded by thousands of runners – capture that moment and envision how you feel, imagine the sound, sight, scent, taste and touch (all 5 senses). Visualize your run and picture yourself successfully completing the race. The advantage of visualization helps improve your confidence and can subconsciously improve your belief in yourself and your abilities. This technique also helps you to be mentally ready for the race and builds mental toughness. It’s now deep into February and you may have already decided to give up on your New Year’s Resolutions. However, it is exactly at this point in time that you can turn a potential failure to stick to your choices into a positive change in your life. Many people fail at keeping their resolutions simply because they make poor decisions in setting these resolutions and set themselves up for failure. Try these simple steps to get back on track; don’t abandon your goals, break them down into more manageable pieces. So you have had almost two months to start work on your resolution and you have failed to even start. Most often resolutions are abandoned simply because we make them “too big” and then cannot decide how, when or where to start. It may be time to truly reflect on your resolution and maybe review it. If you set a goal so unfathomable in a 1 year period, this is your chance to set a realistic goal. If the goal is realistic in a year timeframe, now is the time to break it down into monthly goals. Take your monster resolution and break it down into more manageable steps. We often look at large goals, get overwhelmed by what we promised ourselves to do and get depressed when we are not making enough progress. By breaking this one monster goal down into 12 monthly goals you can start by tackling a small goal and reward yourself when you achieve this more manageable goal. By writing your goals down on paper, in your journal or even better on a social media platform, you are essentially providing a hard and fast goal. It provides a much more “set in stone” goal that you can continually keep reminding yourself of. In a positive way, keep looking at your goal and reaffirming your aspirations by achieving results on a daily and monthly basis. It sounds terrible, but in reality makes more sense to your sense of accomplishment. Try not to look at the actual end-goal, especially if you are easily discouraged. Tackle your daily, weekly and monthly goals without putting pressure on yourself to reach the year-end goal. For example, if you wanted to lose 100 pounds, and only lose 98 pounds by the end of the year; it is still an amazing achievement. By worrying about the daily activities needed to get to the end result, you will actually be doing more to advance your goals than worrying about the end result without putting in the work on a daily basis. If you look to your next weight-loss or healthy work out goal it will be achievable in a positive way. When you achieve a daily, weekly or monthly goal, start rewarding yourself, but remember to keep them in proportion. If you worked out for 30 minutes and kept to your dietary plan, reward yourself with 2 cookies or 1 scoop of sorbet, not a tub of ice cream. All your rewards need to be focused and measured, but you absolutely need to reward good results. At the end of a month, losing 10 pounds or reaching a goal for a 5k run, get a massage. By planning out your route, getting effective support from the people you love, breaking down your resolution into bite size pieces and rewarding yourself, you can get back on track to achieving your New Year’s Resolutions. It’s a New Year and time to plan your race schedule for 2016. If you have run races in the past you know that half the battle of staying fit, is getting out, signing up and staying committed. The easiest part about it is planning your schedule. In order to hit a new personal best PB on a race circuit, in a 5k or even at a marathon race you need to be prepared. Let us help you get there. With the dizzying array of events and food comas that happen around the holiday season every year, it is easy to fall off the treadmill, almost literally. Especially when it gets cold and you dread the indoors treadmill over running out in the crisp, clean and refreshing air; now is the time that you have to get up and plan your year’s race schedule. Gearing up, initially is simply making the commitment to join in the race. Whether you like to run marathons, competitive 5 or 10ks or simple local runs, planning in the first months of the year will get you back on track and excited for earning that new PB. In the beginning of the race season choose races that you have done before or are a little shorter in duration then you are used to. This will really help you get that PB in the first race, the most important one of the year. This sets the tone and pace for the rest of the year. Progressively get longer and less time in between races as you plan for the rest of the year. Of course remember to leave sufficient healing time in between races. If you are going out of town be sure to add in the planning for travel, take along food for race day and be comfortable with where you are heading. Now for the most important part; get back to training. If you took December off for the holidays and still have not gone back to training, now is the time to start. With a month or more off for the holidays, remember to start back into your regimen slowly. Remember when you first did couch to 5k? Most programs get you there in 7 weeks. You generally will not need that much time if you have ran in the past, but starting slow can ensure you do not create injuries before your first race. Pick an app, fit accessory or old fashioned stop watch timing to help you get to a training goal. Remember to get back in shape, may take some time at a rate lower then you were used to before. But just like riding a bike, once you get a week or two of running back under your belt, you will start climbing towards your PB in no time. Make sure you stick to your schedule of races. The only thing that can beat you, is you. The best way to ensure this is to get running buddies to run with and announce your race schedule on social media. This helps keep you accountable for your race schedule. When you do arrive on race day, above all else have fun and race to beat your PB. Last week we mentioned how important it is to take time to stretch before every workout. But how about the minutes that follow a run? Shouldn’t they be used to cool-down and stretch out all of the major muscles you used? The answer is: YES! Stretching after a physical activity improves flexibility, re-establishes a normal range of movement for your body and reduces the potential of any stiffness or soreness by beginning the process of realigning muscle fibers. 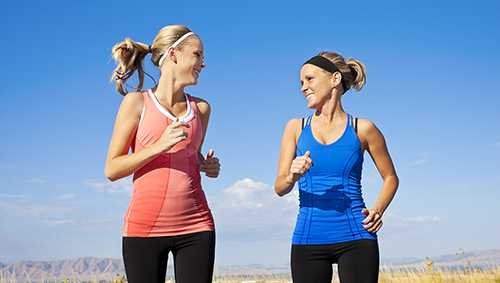 After your run, cool-down for 5 to 10 minutes with a brisk walk or a gentle jog. Then, hold these stretches static (without moving) for 10 to 15 seconds, making sure to do both sides. 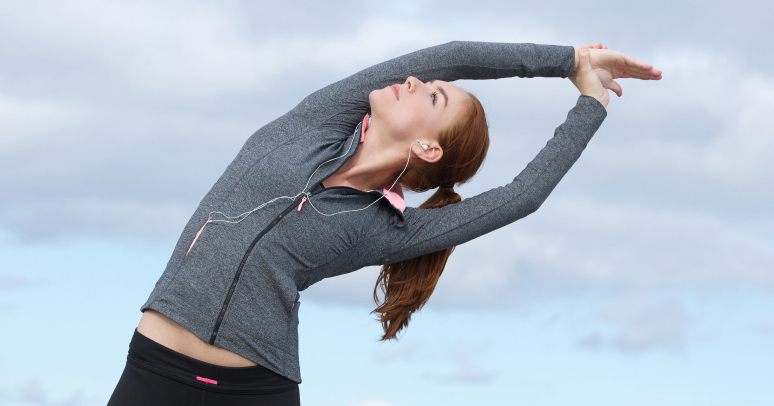 To make stretching more fun and enjoyable, give our app 5-Minute Stretch for iOS a try! Often referred to as quads, the quadriceps femoris are the muscles in the front of your thighs, responsible for lifting your knees and increasing your speed. To stretch them, stand upright and grab hold of a stationary object for balance (a chair, for example) with one hand and use the opposite hand to pull your leg behind you. Try to keep your back straight and your knee pointing downward as you do this stretch to protect your knee joint. The hamstring is the muscle that makes up the back part of your thigh, stretching from just below the knee up into the buttocks. It’s the muscle that lifts the lower leg and bends the knee after the quads have lifted your knees. For this stretch, lay on your back, lift and straighten one leg directly above hips. Holding the calf or thigh, press the heel towards the ceiling as you pull leg back towards the chest. Switch legs. Alternatively, you can do this stretch sitting on the ground. Just extend your left leg, move your right foot toward your inner thigh and lean forward, bending but not rounding your back and waist toward the left foot as if reaching for your toes. 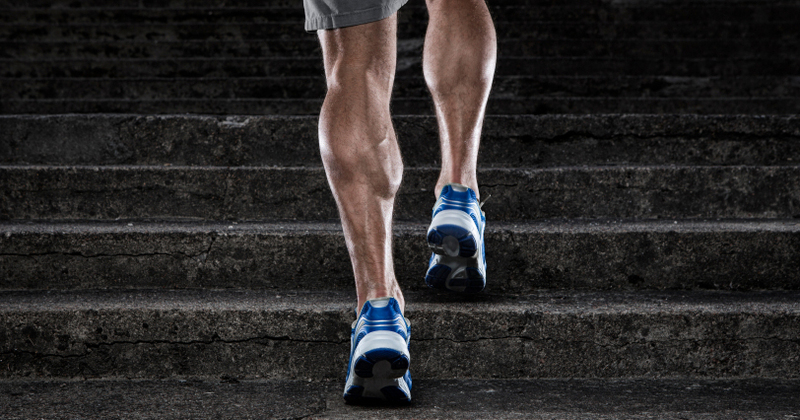 Your calf muscles are located on the back of your lower legs. These muscles are responsible for propelling your legs across your grounded foot while running. To stretch your calf muscles, lean against a wall or other stationary object with your right foot behind your left. Start to bend your left leg forward while keeping your right leg straight. Be sure not to bend the right knee and to keep your heel firmly positioned on the floor. Start with your back straight and gradually lunge forward until you feel the stretch in your calf. Repeat with the other leg. The piriformis is one of six muscles in the gluteal muscles. It’s engaged with every step you take on the run and it’s responsible for lateral rotation of the hip. To stretch the piriformis, lie on your back and cross your legs just as you might while sitting in a chair. Grasp the “under” leg with both hands pull it up towards your chest until you feel the stretch in your buttocks and hips. Hold for five seconds and then repeat on the other side. This is the stretch that most runners forget. But the truth is that running on hard surfaces like sidewalks can lead to lower back pain and irritation. To stretch your lower back, start by lying on your back with both feet flat. Pull your right knee to your chest until you feel a stretch in your lower back. Hold for up to 15 seconds and repeat with the left leg. End the stretch by pulling both knees to your chest and holding this position for up to 15 seconds. Which stretching routine works best for you? Let us know in the comments below! Stretching is an important component of any fitness routine. Although it can be tempting to skip warm-up (especially if you’re on the clock), you should know better. Running with muscles that are not properly stretched can result in injury that keeps you off the road or trail for days, weeks or even months. 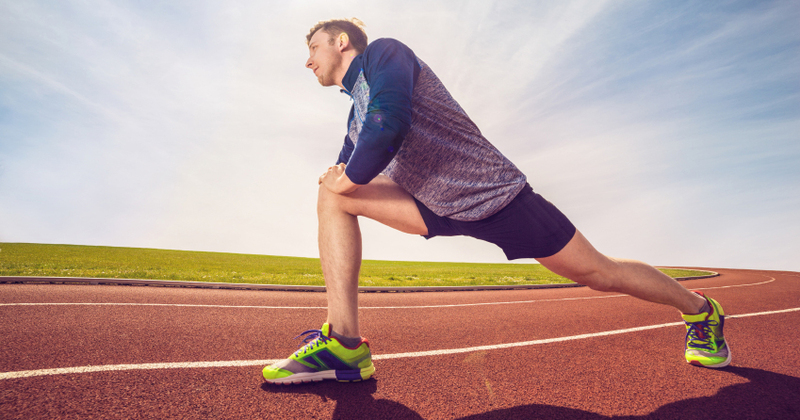 Begin each running workout with a 5 to 10 minute jog followed by these five essential dynamic stretches and your legs will totally return the favor the next time you step out the door. Why are they good for you: walking lunges open up the quads and hip flexors, which are the major muscle groups you’ll be using during your run. Plus, they simulate the forward motion of running, making them a runner-friendly warm-up stretch! How to do them: Stand with your feet together and take a step forward with your right foot using a long stride, keeping the front knee over or just behind your toes. Bend the front knee to 90 degrees and lower your body by dropping your back knee toward the ground. Maintain an upright posture and keep your abdominal muscles tight. Then, rise up and take a big step forward with your left knee to get the stretch on your left side. Why are they good for you: this is a very important stretch, especially for those runners who work at a desk all day. If you do, you probably have tight hip flexors, because they’re constantly in a state of flexion. How to do them: Start in a lunge position (see above how to do it) with your front knee at 90 degrees and aligned over your toes. Straighten your back leg, until you feel a stretch along the front of your back thigh. Raise your arms up over your head and hold for a few seconds, then release. Why are they good for you: along with the kneeling hip flexor stretches, hip circles help you warm up the hips, which is key to a runner’s performance. In fact, the hips is where the hip flexors, psoas, and quads and hamstrings come in together, so opening up the joints and muscles of that area before hitting the pavement can help prevent injury. How to do them: standing with your hands on your hips and your feet hip-width apart, rotate your hips in circles in a clockwise and then counterclockwise pattern, 6 to 10 rotations each direction. Why are they good for you: calf muscles are responsible for every single step you take on your run. When your foot leaves the ground during a run, your calf muscles contract to make that happen. To avoid soreness or – even worse – an injury, give them some pre-run love by doing a simple set of calf raises. How to do them: stand on a step with your toes on the edge and your heels hanging off. Push up with both feet into a calf raise, then slowly lower your heels so that they come below the stair and you feel a stretch through your calf muscle. Why are they good for you: although the cause of side stitches is unclear, some fitness experts say you can help prevent them by stretching your torso before running. How to do them: bring your arms up over your head and, keeping your abdominals tight, lean to the right and then to the left, bending at the waist. Do this movement dynamically, holding for one or two breaths on each side to warm up the muscles of the midsection. If you need help incorporating stretching into your running routine, try our 5-Minute Stretch for iOS! This app takes the guess-work out of stretching and makes it fun and enjoyable. The long-awaited vacation days are around the corner. But a few days away from home also means being away from your regular training routes, training buddies, and training routine. But there is no need to sacrifice your running while you get some rest and relaxation. In fact, training at a new location can improve your performance and versatility, while you might meet some of the area’s friendliest runners. The biggest obstacle to training while on vacation is time. So, as you map out your sightseeing plans, you should also spend some time scheduling your workouts. 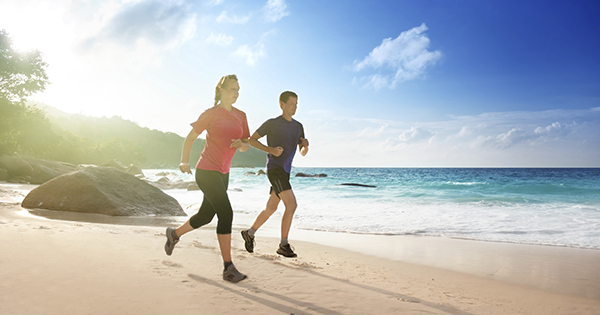 Ideally, you’ll end up with a plan for how your training works into your vacation schedule. If you’re training for a half or full marathon with one of Hal Higdon’s plans, you may want to plan your training so that your vacation corresponds with a “stepback” week. Plan and map your running routes, along with the top attractions and restaurants that you can’t miss at your vacation destination. Check out sites such as Map My Run or Trails.com for running routes at your vacation locale. Make sure you have a few running routes in hand in case some routes you mapped aren’t suitable. By doing so, you won’t feel as concerned about running at your destination once you arrive. Will you be traveling with others? Scope them out to see if there are any runners in the group. If you’re not lucky, you can still register at sites such as Athlinks and SeriousRunning or find a running club that you can join during your stay – RRCA is the place to start looking. Running specialty shops are also a great resource for out-of-town runners. Not only can they provide useful information about running routes, but they may even offer a free group run that you can join. If you’re not 100% sure the running routes you found are safe, opt for the treadmill. Most larger hotels have a gym on site. But if the one you’re staying at doesn’t, try to find one locally where you can work out. Some gyms offer day guest passes or an inexpensive 30-day membership that will allow you to keep your training on track. Entering a race is a great way to see the sights and guarantee that you’ll run at least once during your stay. Search on sites such as runnersworld.com’s Race Finder to see if there’s a race during the time you’ll be staying at your destination. When you’re on vacation, you may end up doing activities that aren’t part of your usual exercise routine, but that can be great substitute for your run. Is there a great hike or a bike ride you can take? 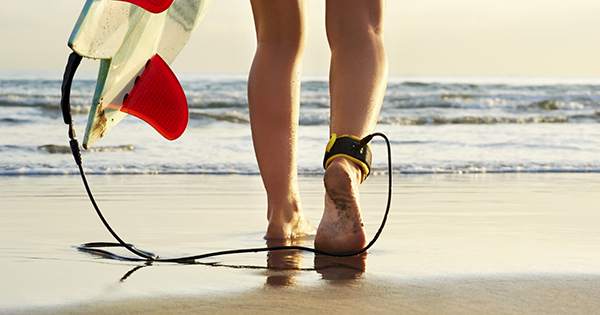 Can you go kayaking, surfing or swimming? Don’t feel pressured to run every day and do one of those cross-training activities, instead. If you end up not having the time to run while on vacation, don’t beat yourself up over it. Enjoy the relaxing days! Your body and your mind will thank you! RunningTrax™ is the first personalized, dynamic running training system that tells every runner exactly what pace they should run – day in and day out. There are more than 200 million people in the world who regularly run at least three times a week. A few are serious, dedicated runners vying for a top national or age-group ranking. This represents perhaps 1% of the total. These runners typically pay hundreds of dollars a month to get personalized training advice: how fast should they run in each workout. However, the vast majority of people who run regularly (the other 99%) have not had any easily available and low-cost way to get personalized advice for their workouts. They read an article in a magazine like Runner’s World or online that talks about training advice. It is helpful to some extent. But, the training advice given online or from a book or magazine has one major drawback: it cannot possibly give you personalized advice on what you should do. Training programs, books and articles can only define a general workout recommendation because it has been impossible – up until now – to define a workout for the millions of runners all at different levels of ability. A training program might say to run three miles. That’s fine, but at what pace should you run? You don’t want to run too slow or too fast. And, what if your neighborhood course is 3.3 miles? How would you adapt the recommendation for a different distance? You can see it’s nearly impossible for someone giving training advice to the public to define a specific, personalized workout for every runner. This is the problem I set out to solve while working on my Ph.D. at Stanford. In order to define a personalized workout, you need to be able to determine each runner’s level of ability. If you could do that, then you would be able to take a proposed workout distance, time or pace and generate a workout that is personalized to each runner’s level of ability. The hard part is to find a way to determine each runner’s level of ability. The reason it is hard to determine your level of ability is because of a simple fact of human running performance: there are limits to what each runner can perform. The highest performances are known as world records. World records are very hard to beat because the human has limits – we can’t improve forever. When you take a large number of runners, the top performance might improve a little over decades but the rest of the performances don’t change much. However, for each and every runner, making improvements at lower levels of performance is clearly easier than at higher levels of performance. Thus, any system to determine physiologic performance cannot be linear, where every unit of speed increase would earn the same unit increase in the runner’s level of ability. Rather, the system that determines level of ability has to reward every unit of speed increase with a larger unit increase in the runner’s level of ability. We call this kind of improvement non-linear because for every unit improvement, larger rewards are provided. Think of this another way. I am runner with a certain level of ability. As I improve, it gets harder for me to improve to newer, higher levels of ability. When I start off, it is easy to make improvements. But, as I improve, I will find it harder to achieve further improvements. In order to correctly model human performance, you have to take this ”limitation effect” into account. A system has to be set up so that it correctly defines the level of ability from beginner to average to world class. I was able to do that by referencing thousands of performances over the past 100 years and then using a non-linear formula that I created with the help of a math professor at Stanford. I used many hours of computer time to calculate the values used in the non-linear formula. This gave us the basis for the values of the level of ability for the ten most popular distances run from 100 meters through the marathon. Let me explain a bit more about how the RunningTrax™ system works. RunningTrax™ is a breakthrough system which solves the most persistent problem for all runners, from weekend joggers to world class athletes. When training, runners need to run hard enough to improve but not too hard or they’ll increase the risk of getting injured. Until RunningTrax™, it has been difficult and expensive for runners to get good advice on how to train. That’s why almost all running websites and apps focus on recording what runners have done rather than telling them what they should do. The RunningTrax™ mobile app is a quantum leap forward in running training. While it provides all the standard features (including GPS tracking, run logging, music integration, etc. ), the new RunningTrax app is the first system to help every runner, regardless of ability, get a personalized recommendation on the proper pace to run for every workout. Typically, it takes a lot of expert time to define appropriate workouts for individual runners. RunningTrax™ is the first to automatically and scientifically determine what a runner should do for any distance, time or pace. In addition, it adjusts to a runner’s changing level of fitness. With kids to drop at school, business meetings, groceries to pick up, personal calls to make, a dinner party with friends, and a billion other responsibilities, how are we supposed to have the time and the motivation to work out? If you’re already managing such a busy (and insane!) schedule, we can guarantee this will be a piece of cake, especially with our extra help! To celebrate the upcoming International Women’s Day, we put together some simple tips and tricks for achieving your health and fitness goals, starting today! Before you step out the door and start your active living journey, think about why you want to make fitness part of your life. Do you want to lose weight? Or are you concerned about maintaining your health and de-stressing while working out? If your main goal is to shed some extra pounds, you’ll find that only a more intense and rigorous schedule – like six days of exercise a week, ideally for 50 to 60 minutes at a time – will do the job. But if you’re looking to enjoy the healthy benefits of consistent exercise, you’ll only need to spare two and a half hours a week from your busy schedule. 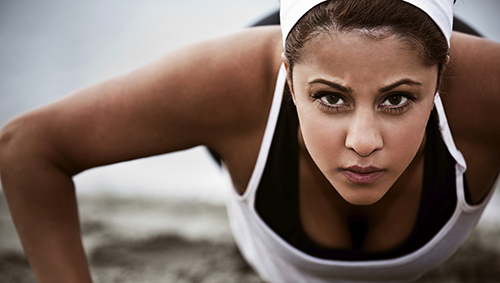 To stay motivated and track your progress, use an app such as Bootcamp or Ease into 5K, if you’re a big fan of running. How many times have you heard yourself saying: “I’ll do it later!”. And how many times “later” became “never”? The longer you wait in the day to work out, the more excuses you can find to put it off. The solution: become a morning person! In fact, research suggests that women who work out in the morning stick with their programs more successfully than those who don’t. But if you’re still skipping workouts, despite all your efforts to get out of bed at 6 am, start treating your workouts as you would an important business meeting: schedule them in advance and don’t ever miss one! Fitness is more fun when you’ve got friends involved. In fact, according to numerous researches, working out with a partner will help you stick with your goals and stop bailing your fitness commitments. You can even take this advice to a next level, by choosing a fitness buddy with whom you are friendly but aren’t all that close with socially. If your fitness partner is a colleague or a friend of a friend, you’re probably going to feel more of an obligation to get to your workout appointments on a regular basis. If you don’t have a lot of time, you should focus your efforts on larger muscles and target every trouble zone with body-weight moves. The most effective exercises are squats, push-ups, lunges, and plank pose. Do them back-to-back as a circuit three or four times, without taking a break. You’ll see results in no time! A short workout is better than no workout at all! Even 10 or 20 minutes of exercise is worth the effort. When you’re really pressed for time, put your creativity to the test! Take the stairs instead of the escalator, walk a couple of extra blocks at lunch or use our 7-Minute Workout app while the dinner is in the oven. These little bursts of activity can truly add up to significant calories burned each day!